[viii]+384 pages with diagrams and index. Octavo (8 3/4" x 5 3/4") issued in blue cloth with silver lettering to spine. Introduction by Larry Evans. Signed by Fischer (Lusis: 1260). 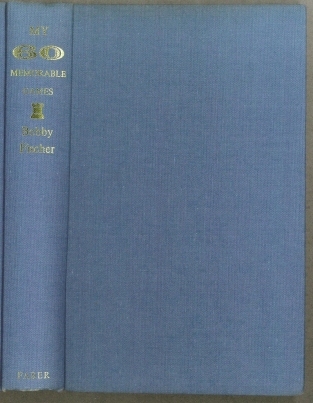 First British edition in a first state jacket with £2.50 on the front flap. 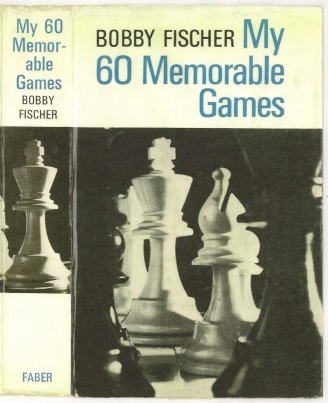 In this book Bobby Fischer analyzes his most important and representative games, showing the strategic considerations, the tactics - and sometimes the blunders - that occur during the pressure of tournament play. He assesses his opponents' thinking as well. 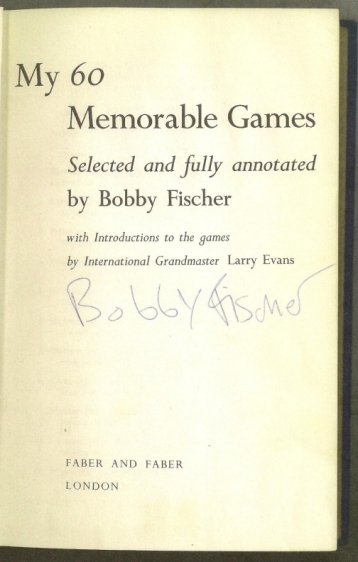 Each game has, in addition to Fischer's own annotations, and analytical introduction by American Grandmaster and former U S champion Larry Evans. Signed by Fischer on the title page, an occasional pencil underlining of text, corners gently bumped. Jacket with some edge wear, spine ends lightly chipped and rubbed else a very good copy in like jacket.